A leading figure in the LGBT film world, Jenni Olson has been making connections between queer films and the audiences who need to see them for more than 30 years. She is one of the world's leading experts on LGBT cinema history and was also one of the founders of PlanetOut.com. She is currently an independent consultant. Jenni is also an acclaimed writer and filmmaker — her latest film project is The Royal Road. Follow Jenni on Facebook or Twitter for updates. To read even more biographical details, please click here. There have been many philosophical and poetic speculations about the unique lure of the Golden Gate Bridge as a suicide spot. Most evoke the image of the bridge as a stepping off point for disillusioned individuals who came West to California looking for something they never found. There are endless attempts to analyze statistics, identify trends, draw conclusions. Everyone wants to understand, explain, find a reason, dwell on the gruesome details. The most gruesome detail of all is that more than 1300 people have ended their lives by jumping off this monumental structure. My friend Mark was one of them. In the decade since Mark’s death I have alternately avoided the bridge and felt compelled to discover more about it. The Golden Gate Bridge is the number one suicide landmark in the world. During the design and construction process, chief engineer Joseph Strauss clearly gave consideration to the bridge's potential as a suicide method. In May of 1936, exactly one year before the Golden Gate Bridge opened, Strauss told the San Francisco Call-Bulletin that the bridge was, "practically suicide proof." Strauss explained that the guard rails were, quote-unquote, "five feet, six inches high and are so constructed that any persons on the pedestrian walk could not get a handhold to climb over them." He went on to add that, "Suicide from the bridge is neither possible nor probable." But when the bridge opened in May 1937 the guard railings measured only four feet high. While the final design ensured a glorious view for millions of tourists, the railing has also proved to be very easily surmountable by now more than thirteen hundred suicidal people. Most people jump facing east, towards the city. This is primarily due to the fact that only the eastern side of the bridge is open to pedestrians. The 220-foot fall takes four seconds. The jumper hits the water at 75 miles per hour. The impact of hitting the water, with a force of fifteen thousand pounds per square inch, generally results in a violent disfiguring death. Fatality is 98% certain. As of 2003, only 26 people had survived the jump. There were numerous engineers and architects who labored in the shadow of Joseph Strauss and have only recently been given proper credit for their contributions to the bridge. San Francisco architect Irving Morrow is one of those men; he is also the unsung villain of this particular story. Joseph Strauss brought Morrow onto the bridge project in the summer of 1930 to redesign the entryways and bridge plazas. By 1931, Morrow had taken on much more than this and had originated many of the bridge’s most remarkable features—in particular, he streamlined the two main towers to give them their distinct deco style. When Irving Morrow came on board in 1930, he made significant adjustments to this design. Morrow’s beautiful charcoal drawings of the time (part of his papers in UC Berkeley’s Environmental Design Archives) display his pioneering vision for the bridge, and clearly depict the lowered pedestrian railing. By lowering the handrail and spacing the rail posts farther apart from one another, Morrow gave both pedestrians and passing motorists a spectacular view over the side. Tragically, Morrow’s vision failed to anticipate that the lower railings would eventually help establish the bridge as the world’s leading suicide landmark. The Golden Gate Bridge opened on May 27, 1937. Ten weeks later, on Saturday, August 7th, a 49-year old WWI veteran named Harold Wobber became the Bridge’s first known suicide. Wobber jumped shortly after 5:00 pm in the midst of Harbor Day festivities on the Bay which hosted more than 200 vessels including the entire Pacific Fleet. The phenomenon of suicide landmarks is a well-documented one. With suicide-prone individuals being drawn to these locations as a special place to die. Examples include such lethal structures as the Eiffel Tower, Pasadena’s Arroyo Seco Bridge, Japan’s Mount Mihara, and the Bloor Street Viaduct in Toronto. At all of these locations, suicides were halted by the erection of physical barriers. Shortly after it’s 1774 publication, Johann Wolfgang von Goethe’s novel, The Sorrows of Young Werther (which concludes with the protagonist’s suicide by pistol) was banned in several areas across Europe. With increasing numbers of young men imitating Werther's desperate act, authorities banned the book in an attempt to prevent the suicides from reaching epidemic proportions. Goethe himself became convinced that his tale was responsible for a continental wave of suicides. In 1974, sociologist David Phillips coined the term "the Werther effect" to describe the phenomenon of imitative suicidal behavior. The Golden Gate Bridge, Highway and Transportation District is a public agency that was formed in 1928 to design, construct and finance the Golden Gate Bridge (in 1969 the purview of the district was expanded to include operation and management of the Golden Gate ferry and bus transit systems, as well). The Bridge District’s Board of Directors is comprised of nineteen representatives. The Board is responsible for formulating policy for the Bridge District. Despite the prominent reference to safety in the District’s mission statement, the Board of Directors has repeatedly decided against erecting a suicide barrier. Suicide prevention on the Golden Gate Bridge has emerged as a topic of public discussion, and front page San Francisco Chronicle reports every few years since the Bridge opened. 1948 saw the first serious consideration of a barrier, with Bridge officials studying, and then rejecting, the possibility of high fences and electrified guardrails. Electric fences were considered by the Bridge Board in 1951 but rejected as unsafe for Bridge workers. In 1953 consulting engineer Clifford Paine told the Bridge Board that the railing could be raised an additional three feet with no negative impact on the Bridge’s structural integrity and at a cost of only $200,000. In 1954 the Bridge Board erected a test section of a barbed wire fence attached to part of the railing near the Toll Plaza. The design was deemed to be hazardous to Bridge workers. In 1970, the Bridge District installed a nine-foot high chain link fence along the pedestrian railing above Fort Point. The fence was erected to prevent tourists from throwing litter over the side of the Bridge into the National Historic Site below. It also prevented any further suicide leaps from the South-facing end of the Bridge. In 1970 the Bridge District commissioned suicide barrier designs from the San Francisco architectural firm, Anshien & Allen. The firm recommended three designs as workable. All of the designs were rejected by the Bridge District. In October 1973, as the world anticipated the Bridge’s 500th suicide, the New York Times reported that the Bridge Board had announced tentative plans to erect a $1 million dollar suicide prevention barrier. The Times reported that public opinion was strongly opposed to the barrier, with 75% of letters to the Board objecting that it would be ugly, ruin the view, or be ineffective on the basis that people would simply kill themselves elsewhere. In 1978, UC Berkeley suicidoligist Dr. Richard Seiden released the results of a study of more than five hundred people who had been prevented from jumping off the Golden Gate Bridge between 1937 and 1971. The study showed that only about six percent had gone on to commit suicide in some other way. Seiden’s conclusions undermined one of the most prominent arguments against a barrier—the idea that people prevented from jumping off the bridge would only find a different way to kill themselves. In June 1995, as the official suicide toll approached one thousand, the California Highway Patrol halted its official count at 997. In July, twenty-five year-old Eric Atkinson became the unofficial one-thousandth jumper. In 1998 the Bridge Board took under consideration a prototype called the Z-clip barrier. Installation of the 7-foot high barrier, originally designed as a livestock fence, was estimated at less than $3.5 million dollars. The Bridge Board ultimately rejected the design. This prototype, along with the 1954 barbed wire prototype, remains on view in the employee parking lot on the west side of the Toll Plaza. In 2001 the parents of Santa Rosa teenager Marissa Imrie, filed a wrongful death lawsuit against the Bridge District following her fatal leap. The District’s reply stated simply that Imrie’s death was the result of her own actions and that she did not use the property with due care for the purposes it was designed. 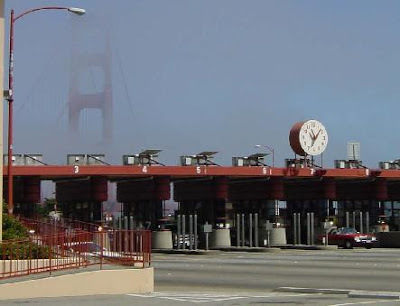 Combined statistics from the Marin County Coroner’s Office and the San Francisco Medical Examiner indicate that there were 25 bodies identified as Golden Gate Bridge suicides in the year 2003, approximately one every two weeks. This official figure however does not take into account the bodies that are not recovered; a figure that could be substantial due to the rip tides and swift currents underneath the Bridge. Local suicide prevention experts believe the true suicide toll from the Bridge is likely twice as high as the official reports indicate. I’ve been through spells of deep depression over the years but I can’t say I’ve ever actually felt suicidal. Alfred Hitchcock’s Vertigo was one of my friend Mark’s favorite movies. He once drove me down to Fort Point, under the bridge, to show me the spot where Kim Novak’s Madeleine jumped into the Bay; where Jimmy Stewart’s Scottie pulled her out. Anyone who’s ever been down there knows it would be pretty difficult to successfully kill yourself jumping off the edge of the Fort Point parking lot into the Bay — it’s maybe ten feet down to the water. On January 14, 2005 an excerpt from the script of this film was published on the Opinions page of the San Francisco Chronicle, in memory of the tenth anniversary of Mark Finch’s death. The following week another filmmaker announced that he had filmed 19 people who jumped off the Bridge during the course of 2004. In early March, the Bridge District board of directors voted 15-1 to approve a two-year, $2 million plan to explore the feasibility of a barrier. This Additional Post Script & Golden Gate Bridge Suicide Barrier Timeline was included on the 2007 DVD release of The Joy of Life. On January 14, 2005 an excerpt from the script of this film was published on the Opinions page of the San Francisco Chronicle, in memory of the tenth anniversary of Mark Finch’s death. The following week another filmmaker (Eric Steel) announced that he had been filming people who jumped off the Bridge during the course of 2004. In early March 2005, video copies of The Joy of Life were delivered to each of the 19 members of the Bridge District board of directors. On March 11th the board voted 17-1 (with one member absent) to move forward with a two-year, $2 million study exploring the feasibility of a barrier. The complete funds for the Suicide Deterrent feasibility study were finally confirmed on April 26th 2006. On April 27th Eric Steel’s film The Bridge had its world premiere at the Tribeca Film Festival. The Suicide Deterrent feasibility study will be divided into two phases and is expected to begin in late 2006. Phase 1 (Screening of Wind Excitation Associated with Generic Suicide Deterrent Design Concepts) will take approximately 6 months to complete and will be immediately followed by Phase 2 (Full Preliminary Engineering/ Environmental and Historical Preservation studies). While the results of these studies are impossible to predict, this current exploration of a barrier represents the most significant progress towards a suicide deterrent solution in the Bridge’s history. For updates on the barrier please visit BridgeRail.org. All text Copyright Jenni Olson (please do not reproduce without permission and proper credit). Please visit www.joyoflifemovie.com for more information about Jenni Olson's film.